The red factor test is a DNA test now available for black horses whose to genotype at the extension locus is ambiguous. This is useful information for people wanting to breed black horses. It says if a black horse can pass on the allele of the extension gene responsible for chestnut. Horses heterozygous at this gene could have chestnut foals or foals of a chestnut related colour, such as palomino, if they're bred to another horse with the chestnut allele. Tuxedo, a 17 hands 2" Thoroughbred, has been tested homozygous for the dominant allele of the extension locus. This makes him a "true-breeding black". This means he won't pass on chestnut to his foals. 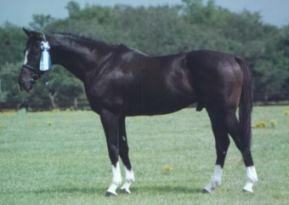 Whether any particular foal is black (or bay, for example) depends on the mare as well as the stallion. They will not however ever be chestnut, even if the dam is chestnut. Tuxedo had a successful racing career in Pennsylvania, with earnings of over $44,000. He now stands at Red Fox Farm, Texas. Thanks to Milynda Milam for allowing me to display this photo. Researchers at the Swedish University of Agricultural Sciences found that the alleles producing black and red pigment differed by a single nucleotide that resulted in a single amino acid change in the protein encoded by the gene. (Nucleotides are one of the building blocks of genes, amino acids are the building blocks of the proteins). The test discriminates between the dominant and recessive alleles of the extension gene by detecting which nucleotide is present at the distinguishing site in the gene. The red factor test is only informative about one part of the genotype, although many more genes are responsible for creating horse coat colors. The agouti gene, for example, controls the distribution of black pigment, and no molecular test is presently available to help breeders screen horses for genetic variation at the agouti locus. However since black horses are homozygous for the most recessive allele of the agouti locus breeders can be sure that black horses will be true breeding for this gene, and don’t need to worry about it.